Luoyang Dahua Heavy Industry Science and Technology Co., LTD. (referred to as HUAZN), the predecessor of Dahua Machinery Factory, was established in the 1958s and has been 60 years old. In 1958, a small iron industry company was established to manufacture simple agricultural tools with bellows and sledgehammers, which became the foundation of the 60-year career of “Dahua”; in 2018, “Dahua” has grown into a formulator of five domestic technical standards. With an annual turnover of more than 400 million yuan, the products are exported to large-scale grinding machinery groups in more than 60 countries on five continents, and have become the leader among domestic counterparts. Luoyang Dahua is a joint-stock enterprise combined with research and development, production, sales and service. The company specialized in manufacturing various crushing equipment, screening equipment, mills, washers, and feeders, conveyors, environmental and deducting. These products can be widely used for sand aggregate production and crushing processing of various mineral in many industries such as metallurgy, mine, building materials, transportation, hydropower, steel, buildings, energy materials, metallurgical slag, construction waste processing, etc. "Over the past six decades, Dahua has been ups and downs and the bumpy; it sounds very complicated, in short, only four words - innovation, integrity!" Time flies, wind and rain, a hard work, a harvest. Our Luoyang Dahua people have gone through 60 years of hard work and hard work in a healthy posture. They have gone through 60 years of unity and mutual ethics, and have passed the 60 years of development. 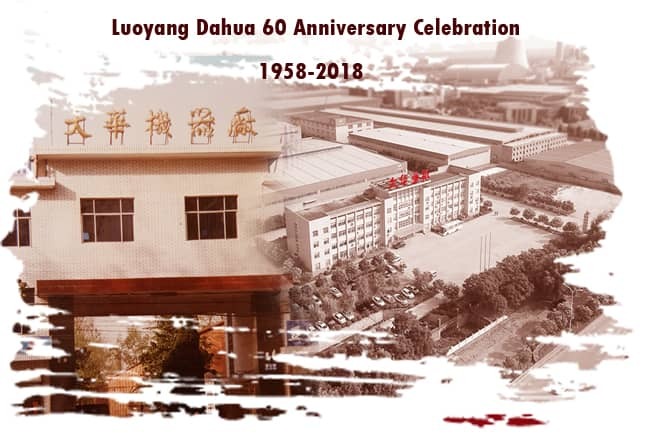 Luoyang Dahua is about to celebrate its 60th birthday. On the occasion of the celebration, congratulations to Luoyang Dahua, for its better development and a new chapter in the new journey. Luoyang Dahua already have a high-quality talent team and a humanistic spirit of continuous innovation and daring to challenge itself. The development based on this will be unpredictable. Believing that the hardships of hope are no longer a bitter, we will be more challenging and sweet. Sincerely wish her a happy birthday! Luoyang Dahua will also be more exciting because of your support! I hope that Luoyang Dahua is booming! "Whether it is time to create wealth for the society, create value for employees, and create benefits for shareholders, it is the need of 'HUAZN'. We always hope to create an international brand, build a century-old foundation, and make the cause of Dahua in the world. On the stage, grow and develop!" Thanks for your support and trust along the way. We will continue to provide you with the best service, high-quality equipment, optimal solution, and become your best partner! Wish Luoyang Dahua 's "ship" is smooth sailing, through the waves, go forward courageous, and create brilliant!